You may remember a post I wrote a while back about McDonalds. I was flabbergasted by their use of the #7 styrofoam container here in Turkey. Well, it seems Burger King is no better. Today I was in one of those moods again. Trying to get some house work done. I still hadn’t gone to the market for groceries since our trip. And I was feeling the urge for American junk food. 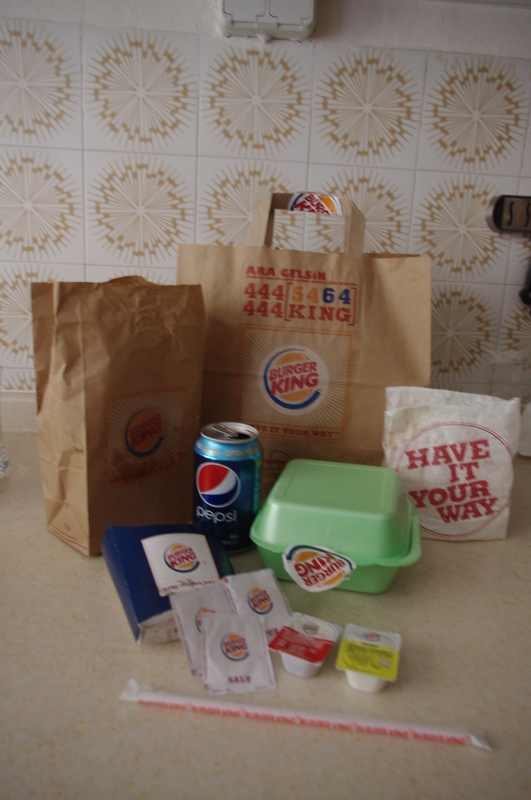 So I ordered the Whopper meal. You know I love ordering things online. There’s nothing like something being delivered to your door! I love those packages arriving with electronics, clothes, sporting goods, and more. Here in Turkey, it’s food. They deliver whatever you want on a moped at no extra charge. But I am seriously going to have to reconsider this habit of mine. Besides the obvious, the weight on my belly and the lightness of my wallet, I guess I am also contributing to the killing of trees and other bad-for-the-environment procedures simply by ordering. Take my Whopper meal for instance. The whopper came wrapped in paper, just like in the U.S. But then they put it inside of a styrofoam container. (Yep, number 7). It was then sealed with a big round sticker. The fries were in their usual cardboard container. Then stuck inside of a brown paper bag. Sodas are delivered in a can. All of these things were neatly wrapped up inside another large paper bag, sealed with another sticker. That’s a lot of paper and plastic for 3 food items, don’t you think? Bad, BK, bad, bad! Real solution for this problem: go Turkish and order Adana kebab from this place: http://ankara.yemeksepeti.com/TR/Restoran/Dicle-Kebap_-Hosdere-Caddesi/2436/TR_ANKARA/m.ys it is one of my best discoveries so far as far as order-through-internet food is concerned. Just your kebab and a small salad are packaged, other than that there are no napkins, no salt, no anything extra :D.
Thanks Reyhan! I will check it out. WOW! That is a lot, it gives the appearance of a meal for four. Being married, you know I can’t do Carrie . . . anymore! Hugs and kisses to you too! Hey ARt, did you see my list of You know you are from West Chester when . . .
Amazed at the delivery phenomenon………but not at the use of the #7 styro. Just found out that allegedly, plastic shopping bags are not allowed on Bozcaada! Sometimes Turkey feels so contradictory, doesn’t it?